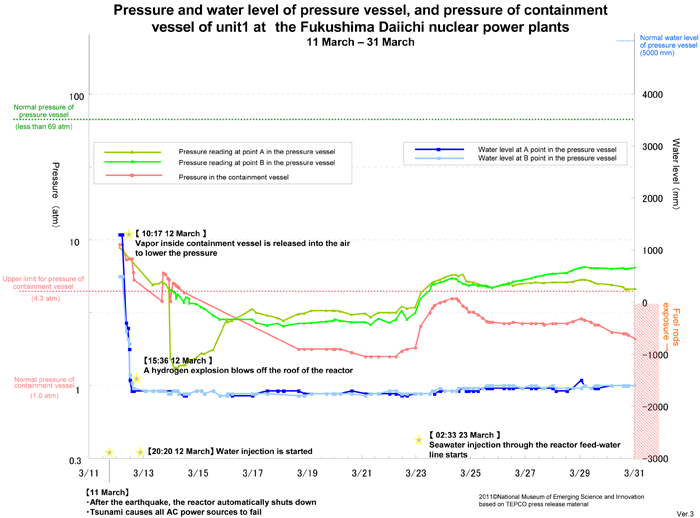 What have been happening in the reactor of the Fukushima Daiichi nuclear power plant? Measured parameters, the pressure of inside of the pressure vessel and the containment vessel, as well as the water level in the pressure vessel, are illustrated in this graph. Investigating the graph with the description of the incidents noted with ☆ mark, you can see the fact of the accident. Change of pressure in a pressure vessel and the containment vessel are illustrated together with the water level in the pressure vessel. Pressure in the pressure vessel: Values are indicated on the left vertical axis. Measured at two points, A and B. During the normal operation, the pressure should be about 69 atm. Pressure in the containment vessel: Values are indicated on the left vertical axis. During the normal operation, the pressure should be about 1atm. Design upper limit is 4.3 atm. Water level in the pressure vessel: Values are indicated on the right vertical axis. Measured at two points, A and B. The level of 0 mm corresponds to the same height as the top edge of the fuel rods. During the normal operation, the level should be around 5000 mm.